This post was published just before 3:15am from my Mom’s home in Holbrook, NY. I need to get out of bed soon and pack. I am a late-packer :). I fly home today from ISP (Islip) on Southwest departing at 11:40am; right now the flight is showing on time despite the big flight delays in FL over the weekend. Jim will pick me up at MCO (Orlando) at about 2:30pm. This post, which took me about 1 1/2 hours to prepare, marks 247 consecutive days with a new enjoyable and educational blog post. I Am Not Very Good At Mini-Landscapes/What’s Different? In the I Am Not Very Good At Mini-Landscapes/What’s Different? post the four folks who responded pretty much nailed all the differences. Kudos to Doug West, David Policansky, Naveena, and Andrew McLachlan. In the My Two Favorites From a 1362-Image Day on Great Gull Island… post I like both images equally well. I love the splayed feathers of the braking tern with the green background and find the shade of blue in the taking flight image irresistible. It would seem as if Paul Mckenzie were inside my head when he wrote, “The one thing I don’t like about the first image is the bird’s bill slightly protruding past the tail feathers – would have been better if the entire bill was framed within the tail feathers.” That is exactly what bugged me. Folks covered the strong points of each image quite well. As for the perceived weaknesses I disagreed with many of those. I have replied to each and every comment on this thread. I preferred this image to the one with the read sky for its simplicity and child-like qualities. 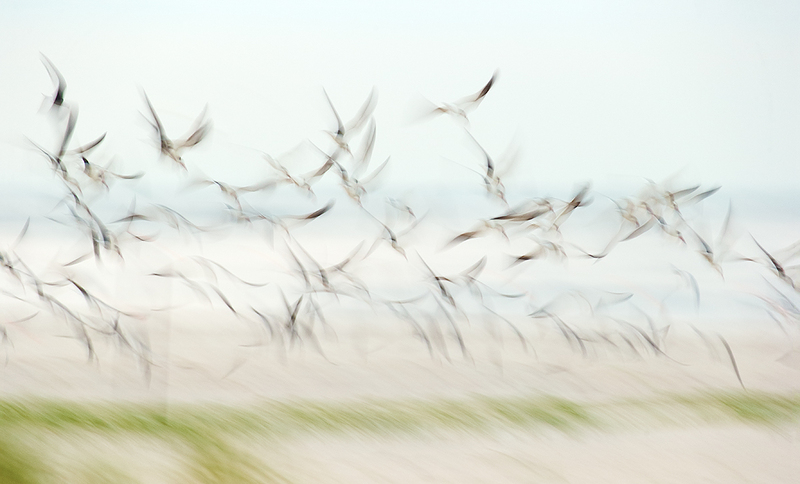 In the first image there were several really close, really blurred out-of-focus birds that were distracting. We teach that principle on the Bosque IPTs most every day. For the first image the lens was pointed at the relatively bright eastern sky, at the spot where the sun would rise in less than 30 minutes. In the second image the lens was pointed in the opposite direction, 180 degrees away from the light sky thus the need for a much higher ISO setting. With the 2X TC in place the focal length range of the 70-200 is 140-400mm. Since one image was made at 140mm and the other at 400mm I used 100% of the focal length range. Though we have sold a ton of great stuff in the last 2 weeks there are still several great buys like the one above. Click here to view all the current listings. If you are a seller, be sure to read Mark’s helpful warning comments at the bottom of the page. We now have 3 folks signed up with five others seriously interested not only in the IPT but in the possible 3-Day pre-trip to Ireland…, If you are seriously interested it would be best not to tarry. Click here for complete details. In the image above Mr. Murphy did indeed strike again. That left me having to do some fancy work in Photoshop in what seemed at the time like a perfect set-up. When the chick peeked out from the adult’s breast I fired off a 25-frame burst without filling the buffer on my dependable Delkin 64GB 1000X Compact Flash Card. For the first 13 frames the head angle for the adult was perfect but the head of the chick was turned well away. On the 14th frame, the one that served as the base image for the optimized image above, the chick–as you can see–turned nicely towards me. But no, could it be true? On that very frame the adult turned its head well to the right. So I painted a Quick Mask of the head of the adult in the 13th frame and placed that layer atop the head of the adult in the 14th frame. It took quite a bit of work getting everything lined up properly and fine tuning the added layer with a Regular Layer Mask. To further complicate things the background below the bird’s neck looked a bit phony in the original capture, frame 14…. No amount of work there could get that area to look natural to me. Thanks to Ted Wilcox for leaving a comment and pointing out that the image in the original post needed a good deal of clockwise rotation. The image above is a re-do with 1.5 degrees of clockwise rotation. I used the John Haedo technique for filling in the needed canvas (as detailed in Digital Basics. Artie: Thanks for following up. I do think about your questions and so it’s really helpful when you follow up this way. 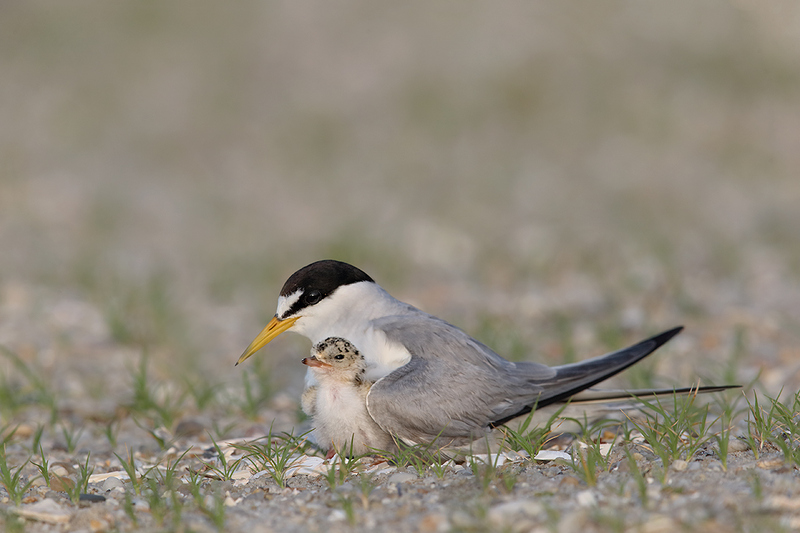 The image of the tern and its chick is stunning.